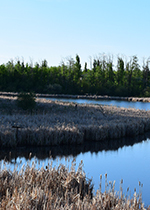 This guide shows the trail system parks within Strathcona County. Use the map features below to plan your route and filter by trail surface type, park amenities and subdivisions. 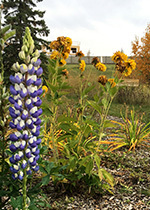 This guide provides information on featured routes along with 287 km of trails in Sherwood Park. Explore new routes and make your bike ride a little more interesting by visiting points of interest along the way. Single loop trail that will take you through Centennial Park, past the legacy forest and pollinator habitat. As you ride past Lakeland and Sherwood Drive, you are also on part of the TransCanada trail. 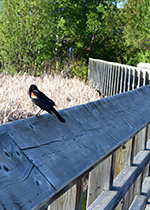 Stop at the benches and lookout points along the wetlands to watch for waterfowl. A looped trail that passes green space, water and more, including the Emerald Hills Leisure Centre and Regional Park. 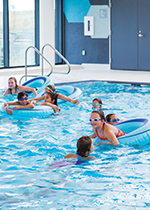 Cycle to the pool for a fun recreational swim. Stop and admire the public art in front of the Emerald Hills Sport Pavilion. A fun trail that will take you to the BMX Bike Skills Park, featuring dirt ramps, rock boulders and logs. Enjoyable for all ages and skill levels. 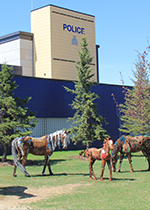 View public art at the Fire Station 6 and RCMP station. Take a side trip to the Clover Bar Ranch Spray Park. This point-to-point trail takes you through the quiet neighbourhoods of Summerwood to Regency Park. The trail will take you past the Something Fishy loop. 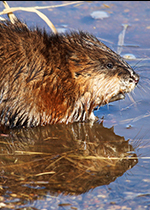 You will pass playgrounds, fields and wetlands. Just off this route is the Heritage Hills Children’s Pump Track. This unique looped trail features some gravel and boardwalk terrain. Interpretative signage, benches and lookout points along the route make for a fun family learning experience for all ages. Look close along the trail to spot the fish ladder! This short looped trail is serene and boasts a large green space for a picnic or place to enjoy a quiet book on your travels. Interpretative signage provides an educational experience. 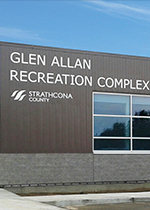 This looped route features parking and washrooms at the Glen Allan Recreation Complex. 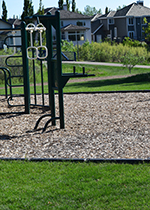 Along the route you will find four playgrounds, shale trails through forested areas and many picnic tables and benches. Stop and use the outdoor fitness behind the Glen Allan Elementary School. This trail incorporates Nottingham Blvd and loops back around to Strathcona Athletic Park. The island, which was constructed in the 1980’s, features a fun playground and outdoor fitness equipment, as well as a gravel trail circling around the island. 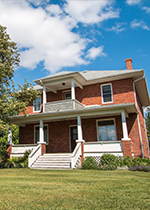 Cycle through Strathcona County’s humble past including Lord Strathcona, Smeltzer House interpreative signage and public art, the Ottewell homestead, the Lendrum Sisters, and memorial trees. Jaunt across Broadmoor Blvd to see the covered bridge in Woodbridge Lake Park. 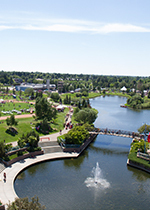 Start at Broadmoor Lake Park and make your way to Herb Belcourt Park. This scenic trail includes interpretative signage and several pieces of public art. Let the kids cool down in the RE/MAX Spray Park and Playground. Pedal down to the Prairie Walk to Community Centre, Gallery@501, and Library. This 22 kilometer section of trail in Strathcona County is part of the regional trail system along the North Saskatchewan River. The entire regional trail system is 88 kilometres, connecting Devon to Sturgeon County. Download our mobile parks app to view information about Strathcona County parks, events & drop-in schedules from your Apple, Android and Blackberry devices. Do you have questions or feeback to help us improve these maps?